When it comes to procuring cleaning services for their medical office, many property owners struggle to find a commercial cleaning company that has the organization and expertise to effectively get the job done. Normal office cleaning services are needed for establishments to remain clean and presentable, including the full array of carpet cleaning, trash removal, and surface sanitation. Medical offices, however, require special efforts in addition to this full lineup of janitorial cleaning services. It’s important for you to find a local cleaning company that holds a full history of excellent customer satisfaction in this field, drawing on years of experience and amazing outcomes. For years, Super Serv has worked to become your go-to source for quality janitorial services in Boston and beyond, delivering reliable results to keep your operations running smoothly. The caliber of janitorial services needed for medical office cleaning is no joke, and our company means serious business. Today, we’ll discuss a few unique needs associated with medical offices that our cleaning services can handily take care of. If you’re in need of a janitorial company with a comprehensive approach to optimizing your medical building’s operations, be sure to reach out to our experts today! Removing hazardous or infectious items from your property requires regular training and a plethora of extra precautions. Medical offices are known for housing hazards such as used needles, contaminated clothing, and blood samples. While your facility may have a bin for the proper disposal of needles and dangerous items, the risk always remains for a dangerous product to be placed with the ordinary refuse. Any injuries at this junction can result in incident investigations and medical treatments, possibly increasing the operating costs for your facility. Our professional janitors have the experience and training necessary to make trash removal from your facility as quick and as safe as possible. Our stringent hiring methods ensures that only the best personnel serve your building. The nature of medical offices inherently involves sick individuals, creating a haven for harmful germs. While normal cleaning services often include the sanitization of surfaces, medical offices require much more attention to detail. Failing to properly clean your facility can put people at risk for contracting an illness, creating major issues for your operations. Patients who are ailing from a new issue may blame your facility directly for their woes. Medical professionals who become ill cannot help patients, disrupting your company’s ability to treat people in need. Sickly staff will lead to big losses in productivity, hampering your operations and possibly your reputation. 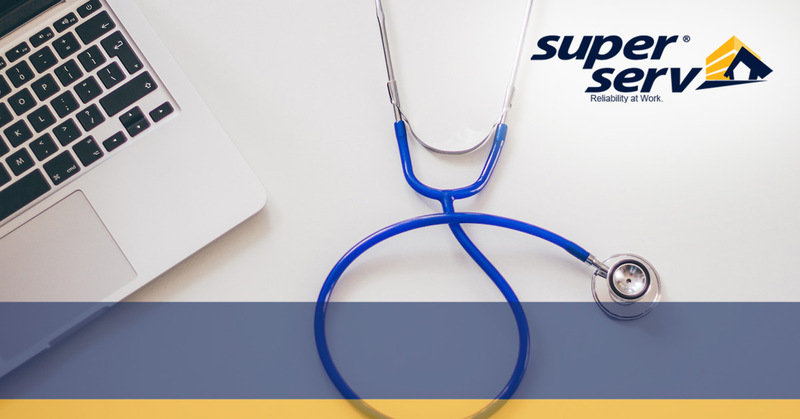 The Super Serv team is here to provide specialized cleaning services for your facility, creating a personalized plan that will ensure that your medical operations run with health and regularity. Your medical facility’s reputation relies on a sparkling clean shine, including overall cleanliness that covers every inch of the building. The nature of medical care necessitates the need for immaculate cleaning outcomes, including areas that do not center around medical services. Providing a clean sheen for your patients will help greatly in comforting them during this stressful time, as cleanliness is akin to quality. Individuals who are worried about their experience at your facility will not be impressed if they find evidence of previous incidents, including blood, grime, or any other sign of illness. The high expectations of cleanliness for medical buildings makes it essential to find an outfit that can consistently shine your facility for long-term success. The extensive needs and regulations involved with medical office buildings can make it hard to effectively clean your property. Many facilities rely on a strong HVAC system, for example, to keep air quality consistent within the building. Many of the rooms share a common system for treated air, making it vital to hire a cleaning company that has the skills and equipment to provide janitorial services that clean the building as cleanly as possible. The risk of contamination through germs and allergens in the air is high, making it essential to follow proper procedures for maximizing air cleanliness. Our team has the training to ensure quality results for your facility, and we understand how precarious medical office cleaning can be. Spraying a noxious cleaner in one area, for example, may spread particles of that harsh chemical to other rooms in the building, creating major concerns for patients. Your facility relies on meticulous sanitation measures that are done on a weekly or daily basis, making it important to utilize products that are green and safe. For many companies, it can be challenging to balance the safety of cleaning products with the effectiveness needed for full sanitation. Failing to strike the perfect balance between these two goals can create major hazards for your facility. Super Serv is proud to provide a full arsenal of safe and effective cleaning products to meet the high standards required of your medical facility. Your medical office building will inherently require a major amount of attention to ensure the best outcome for your patients and employees. Being able to find a quality cleaning company that can meet the unique demands of your Massachusetts facility may be a challenge, but we’re here to help! Super Serv strives to create the best experience for each of our customers, relying on quality training and modern technology to optimize operations while minimizing costs. If you’re looking for janitorial services in Boston for your medical building, be sure to contact us today for a quick and accurate quote!